Panasonic today launches the stylish and easy-to-use LUMIX GF5, designed to produce DSLR image quality and HD video from an ultra-compact body. With a new high-sensitivity 12.1 megapixel Live MOS image sensor and new Venus Engine with Multi-process Noise Reduction, you�ll get outstanding performance across a wide ISO range and great pictures in every situation. High-speed, precise and intuitive, the interchangeable lens LUMIX GF5 is designed to take photography to the next level. Outstanding imaging capability: A new high-sensitivity Micro Four Thirds 12.1-megapixel Live MOS sensor gives you improved image expression across a wide ISO range (160 � 12,800). The advanced sensor combined with the improved high-performance Venus Engine VII HD2 image processor, featuring Multi-process Noise Reduction, lets you take rich photos and HD movies with low noise, even in low-light situations. Slim and stylish: Sleek curves and sophisticated design means that the ultra-compact light-weight camera can easily slide into your pocket or bag, ready for adventure. With a quality aluminium chassis, built-in flash, easy-to-handle grip and a choice of four colours, the LUMIX GF5 is a fun and powerful camera. High speed, high performance: Be spontaneous without worrying about losing detail. When the action happens in a split-second, you�ll always be ready to shoot with the LUMIX GF5�s 0.09 second Auto Focus � providing clarity and fine detail at moment�s notice. You can shoot crisp images of fast-moving subjects thanks to the high-definition burst shooting at four frames per second. Meanwhile a wide range of intuitive Auto Focus modes mean you�re always in control of the shot. With just one touch you can Auto Focus lock so the LUMIX GF5 will track the subject even if it moves, and the Pinpoint Auto Focus means you can zoom into specific areas in a frame to focus on with absolute precision. Sharp and clear Full HD video: Film your world as it happens in glorious 1080p Full HD video and record in stereo sound. Video is filmed in MP4 format so you can instantly transfer the footage to enjoy on your portable devices. You can switch to live action recording instantly with the dedicated Video Record button. And thanks to full time Auto Focus and Auto Focus Tracking, once you�ve chosen the subject the camera will automatically track and follow its movement, meaning you can get sharp, clear footage with ease. Creative control: The LUMIX GF5 gives you in-depth controls with an intuitive user interface. Unleash your creativity with many new filter effects � including Soft Focus, Star Filter, Toy Effect and more � letting you apply captivating visual effects to your photos without the need for post-production software. Shoot elegant street scenes with Dynamic Monochrome, and make your photos stand out with One Point Colour mode. Artistic and versatile: With just the swipe of a finger, filters can be fine-tuned for a perfectly balanced composition. The LUMIX GF5 even provides filter recommendations, as well as on-screen scene guides, so you can experiment with confidence. Professional results at your fingertips: The intuitive user interface and touchscreen give you in-depth control over your shots. You can use Pin-Point Auto Focus to make the important areas stand out. Shoot professional looking images without needing extensive photography knowledge with Intelligent Auto (IA) and Scene Guides � where you can choose from over 20 scenes in five categories to add your own creative spark to your photography. Incredible range of Micro Four Thirds lenses: Push your photography to new levels with the simple-to-use interchangeable lens LUMIX G system. 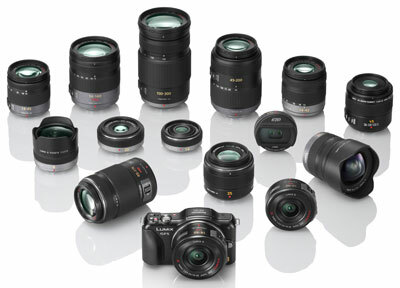 Switch lenses in moments to capture the perfect shot or give your photography a new perspective, choosing from the biggest line-up of Compact System Camera Micro Four Thirds lenses. Hybrid controls: The LUMIX GF5�s stunning 3.0-inch 920k dot LCD touchscreen with wide viewing angles, lets you frame the scene instantly and aim for the perfect shot every time. Meanwhile an intuitive control dial allows you to quickly and easily scroll through your pictures and videos, as well as explore the camera functions with on-screen guidance explaining each feature. Built-in flash: For well-exposed photos in difficult lighting situations, the LUMIX GF5�s spring-loaded flash is stylishly hidden and ready to help you capture the perfect shot. 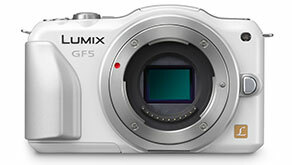 Accessories: For a comprehensive photography experience, the LUMIX GF5 has a wide range of accessories available. A number of mount adaptors means you can continue to develop your skills with different lenses, and additional filters and tools such as the remote shutter control mean you can experiment with new ideas. Further information about the GF5 is also available in the �LUMIX G Experience�, a free iPad app allowing keen photographers to explore the world of LUMIX G before purchasing a camera. The feature rich app is available in Europe, without charge, from the iTunes App Store and includes, amongst others, detailed technology explanations, line-up demos and comparisons with traditional DSLR cameras.